Insulate and finish the door from the inside. 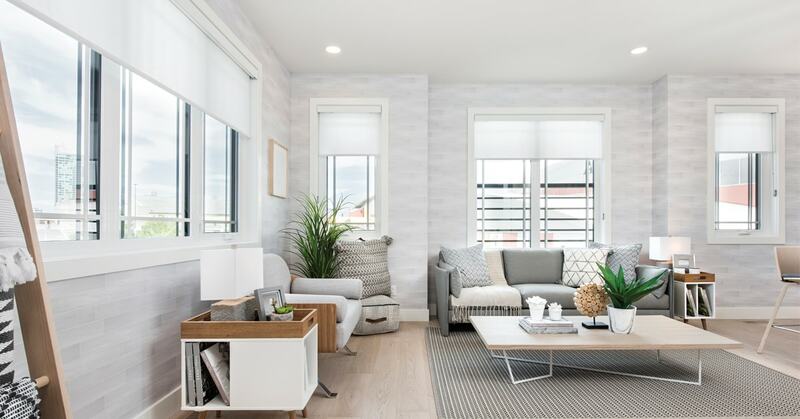 There a few reasons to replace the patio door: if the glass is broken, the wood frame is damaged or weather-worn, or if the structure is no longer air and water-tight, resulting in leaks and heat loss. 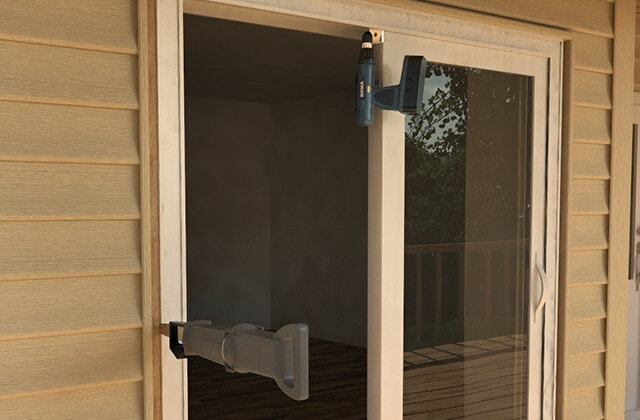 Replacing your patio door is not that difficult. A few hours and some help is all you need. 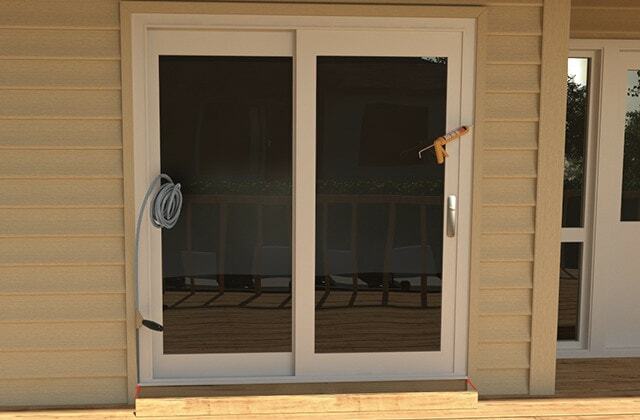 This project will show you how to install a patio door with nailing fin. The exterior vinyl cladding around the door frame has to be removed before the door can be installed so the new door frame can be screwed into a strip and secured directly to the structure of the house. 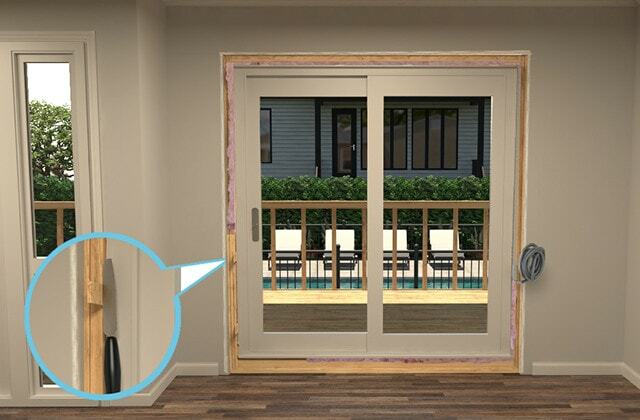 Install flashing and you will waterproof the opening of your new sliding patio door. Note: waterproofing and finishing a finless patio door is different. 1.1 - Remove the interior trim to expose the jambs. 1.2 - Measure the height on both sides of the opening. Measure from the lintel down to the subfloor, the actual surface the doorsill rests on. 1.3 - Measure the width across the bottom and top of the opening. Always measure from the jambs and not from the frame of the door you are replacing. 1.4 - For each pair of measurements, retain the shortest of the two. 1.5 - Measure the frame of the existing door. Measure the width and height from the outside edge of the frame. 1.6 - Measure the total thickness of the wall. Vinyl cladding: measure from the interior drywall surface to the exterior lath the vinyl siding is nailed on. 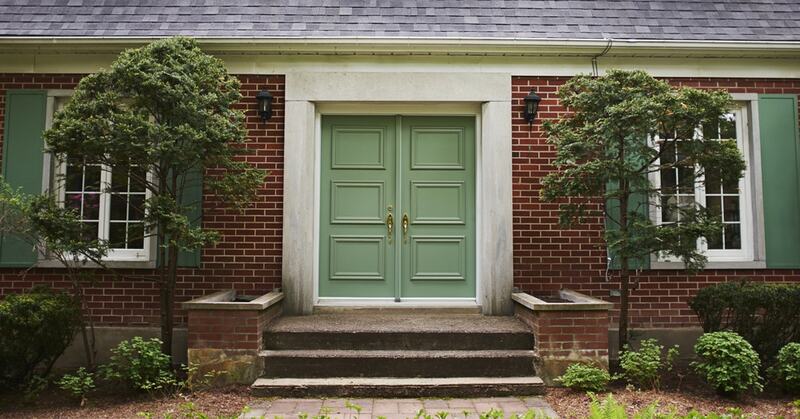 Brick exterior: measure from the interior drywall surface to the marks left by the old door on the brick. 2.1 - Remove the screen door from the track. 2.2 - Depending on the door model, loosen the screws holding the rollers. Lift the sliding panel out of the lower track. 2.3 - Unscrew and remove the angle brackets on either side of the stationary panel. Slide the panel to the middle of the door frame, then lift and remove. 2.4 - If the door has a nail fin, remove a section of the exterior wall cladding in order to release it. Unscrew the door and lift it out of the frame. 2.5 - For a standard finless door, unscrew and remove the side jambs and the lower and upper tracks from the door frame. 2.6 - Remove all exterior caulk around the door casing. 2.7 - Use a reciprocating saw to cut between the casing and the jambs. Do not cut under the threshold. The door casing must be held steady while you cut. 2.8 - Remove the casing from the opening. 2.9 - Loosen and lift the threshold; you may need to use a crowbar. 2.10 - Clean all residue and caulk from surfaces of the frame. 3.1 - For a new door with nailing fin, remove sufficient exterior vinyl cladding around the opening. 3.2 - Ensure that all parts of the frame are in good repair. Remove all debris. 3.3 - Apply self-adhesive flexible waterproof flashing to the sill and 6" up each jamb. 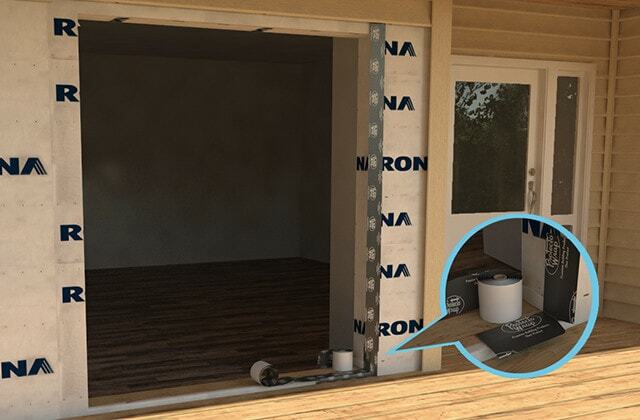 The membrane must cover the drip cap or the building paper on the exterior wall, under the sill. 3.4 - Cut the corners of the flashing to facilitate folding. Cover the entire door sill. 3.5 - Apply self-adhesive flexible waterproof membrane to exposed surfaces on both sides of the opening. 3.6 - Fold the surplus to wrap around the jambs. 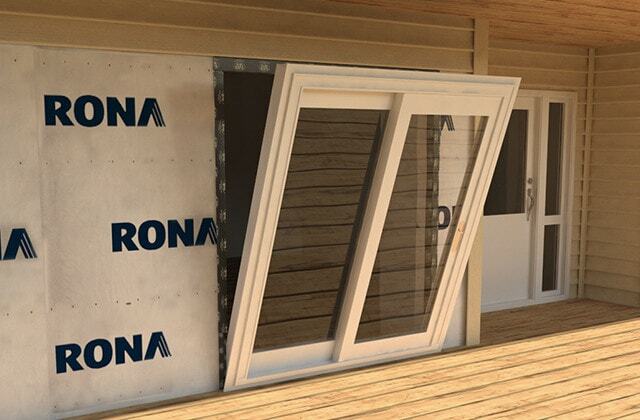 3.7 - Always insert the membrane under the existing exterior cladding. 4.1 - Run two or three beads of caulk over the sill and around the opening where the nailing fin will press against the flashing. 4.2 - From the outside, place the bottom of the door frame on the sill, then tilt the door into the opening and push the nail fins tight against the sheathing. If the door is finless, the outer edge of the frame must be flush with the lath where the vinyl cladding will be nailed. 4.3 - From the inside, insert wood shims to stabilize the door. 4.4 - Adjust the shims to centre, square, plumb and level the casing. 4.5 - Space shims every 12" but at least 8" from the corners. If shims are needed under the sill, space them 8" apart. 4.6 - Continually check that the door is level and square. Insert enough shims to support the casing, but never force. 4.7 - Measure the two diagonals of the door frame: they should be identical, with a maximum allowable deviation of 1/8". 4.8 - Level the casing both horizontally and vertically (plumb). The maximum allowable deviation is 1/16". Adjust where necessary. 4.9 - From the outside, screw in the nailing fin starting with the lower corners, then the upper corners. For a door without a nailing fin, remove the cladding at the sides of the door. Nail the frame to the jambs at the appropriate (marked) places, through the shims. Replace the covering materials. 4.10 - Screw through to the frame of the house. 4.11 - Do not screw into the header or sill. 5.2 - Insert fibre glass insulation all around the frame. 5.3 - Fill the space with continuous layers of insulation rather than small pieces of insulation inserted separately. 5.4 - If shims were inserted under the sill, caulk the spaces between them. 5.5 - Install interior trim. 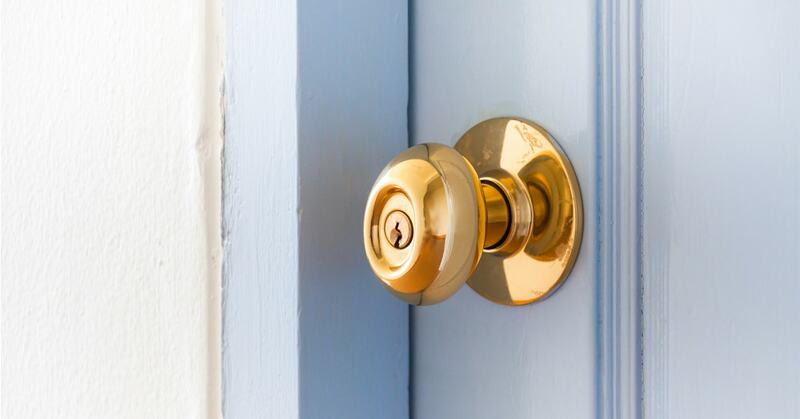 You can use polyurethane foam to insulate doors and windows, but it demands some experience to handle it properly. Too much product can exert pressure on the frame and deform it. Waterproof the exterior of the patio door with nailing fin. 6.1 - Cover each side of the door with a self-adhesive membrane. Cover the edges of the nailing fin and ensure that the membrane is fully adhered. 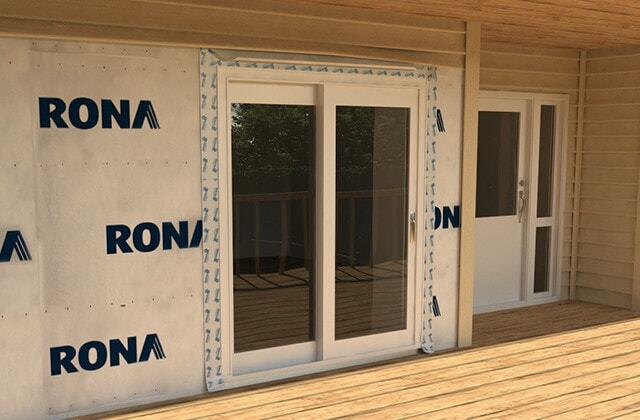 6.2 - Install run-off moulding and apply a self-adhesive membrane above the door under the air barrier. 6.3 - Apply sheathing tape on the self-adhesive membrane. 6.4 - Lower the air barrier above the door and glue. 7.1 - Measure around the patio door. 7.2 - Cut two pieces of J-trim for the sides and nail. 7.3 - Cut the J-trim for the top, 2" longer than the width of the door. At each end, cut a 1" notch on both bottom corners of the J-trim and bend the tab over at a right angle. 7.4 - Make a 45°mitre cut in the section before the J-trim towards the roof line and nail. 7.5 - Fit the upper moulding strips into the notches of the two lateral mouldings to make a rain-water run-off. 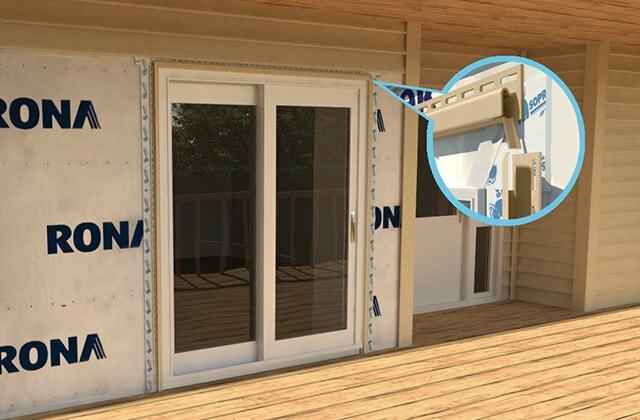 Lay a silicone bead around the exterior frame of the patio door. 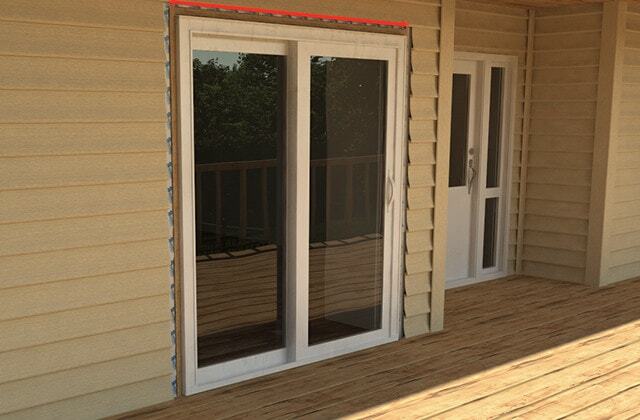 Complete the exterior finishing of the sliding patio door. 8.1 - Fit a neoprene backer rod between the J-trim of the exterior cladding and the door frame. 8.2 - Apply silicone caulk around the exterior frame and on nail heads. 8.3 - Depending on the model, you may need to put a wood shim under the sill. Cover with aluminum cladding and seal.